In just a matter of HOURS Andy Copping will unchain the padlock on the hallowed gates of Donington Park and the rock n' roll hordes will swarm into the promised land for three days and nights which will become forever embedded in the hearts, minds and souls of almost 100,000 rock revelers. The eager-beaver campers among us are already on site, in deck chairs, swilling from cans by our tents as the Download family welcomes us all home. Download Festival is the Mecca for Metal, the paradise of punk, the heaven of happiness and the promised land of rock n' roll. Copping, who is festival booker, has put together a weekend packed with so many star names the festival poster should be listed in neon lights. The Live Nation chequebook has taken a pounding as the UK's - scratch that - the world's - premier rock music festival is putting on a blockbuster weekend for our listening, and living pleasure. The turf at Donington Park is the holy land for rock bands and rock revelers alike. Over the years the great site has hosted Monsters of Rock and latterly Download Festivals which have shaped generations and left deeply ingrained rock horns on the musical hearts and souls of so many. This time around the reformed, rejigged, revitalized and unrivaled most dangerous band in the world are top of the bill. Guns N' Roses are back. Axl brings the baddest band on the planet to Donington with his right hand man Slash and left hand man Duff back in the band. Hot on the heels of 2017 highest grossing tour on Earth Guns will bring the curtain down on Saturday night at Download and I, like most, can't wait. Sharing the top of the podium as headliners are also Avenged Sevenfold on Friday night and the Prince of Darkness himself Ozzy Osbourne on Sunday. In just two-odd days I will be alongside an expected 100,000+ like minded rock revelers on the sacred turf for the 2018 edition of the best weekend of the year and this year is shaping up to be better than ever before. I can already see the scene as the sun sets and the sky moves from deep sea blue to purple in the East Midlands sky while the bona-fide future headliners Volbeat - surely a shoe in to make the leap from upper festival slot to headliners on the near future - will bring their unique blend of metal, rockabilly and melodic hooks to the main stage. On subsequent nights Kentucky rockers Black Stone Cherry and shock rocker Marilyn Manson will take the sub-headline slots, playing in the fading light to an ocean of happy, grinning rock fans – Downloaders scattered throughout the vast expanses of Donington Park. Standing in a field full of your musical brothers and sisters, shoulder to shoulder with your best friend or other half with the sun (hopefully) bearing down on your back, a cold drink in your paw, the other arced skywards in the traditional rock horns shape. As the gates open to the promised land on Friday, we will charge onto the turf like an army of paper cup and grin wielding Spartans. Aside the headliners who I mentioned earlier, the likes of Babymetal, Shinedown, You Me At Six and Body Count head up a bill stacked to the rafters with the kind of bands you'd happily drive over a one-eyed orphan kitten to see and others? Well they are just new favourite bands waiting to be discovered by you. Rewind 12-months and I was one of the thousands who stood wide-eyed and slack-jawed in welcome astonishment at three glorious days of sunshine - a marked improvement on Drownload 2016. In 2017 Mother Nature was on her best behaviour and it made a great weekend all the more pleasant and memorable. But to be honest when the music, the memories and the ride is so good, nobody gives too many shits about the weather. Even during the afore mentioned muddy hell of 2016, Mother Nature's latest furious moodswing couldn't dampen or dull our enthusiasm and love for the Download Festival. So if that couldn't beat us determined and devoted Downloaders then nothing she can throw at us will. At the risk of repeating what I said earlier – Download is the best weekend of my year every year. 2017 was no different but this summer's festival is now appearing as a dot on the horizon. In a little over 48-hours we will be nesting down in East Midlands all over again. Time to start stocking up on baby wipes, portable power banks for your phones and preparing to make another head and heart full of unforgettable memories. 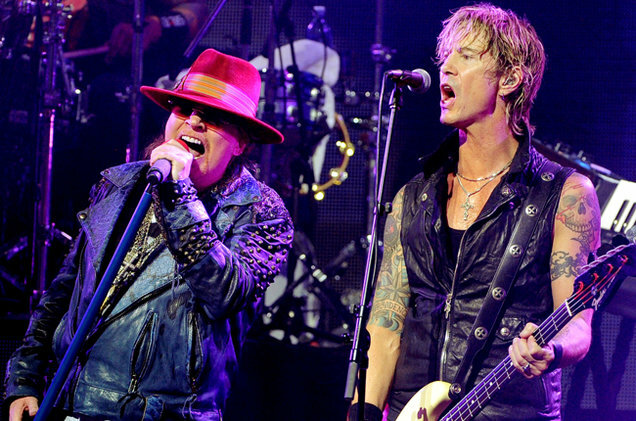 After all Guns N' Roses – 'Estranged,' 'Jungle,' 'Rocket Queen,' 'Nightrain' are the kind of songs from a legendary band which turned so many of us onto this gloriously muddy path to festivals like these in the first place. Horns up and see you and all the metal army in a little more than two days - no rain this time though Mother Nature you moody old boot.